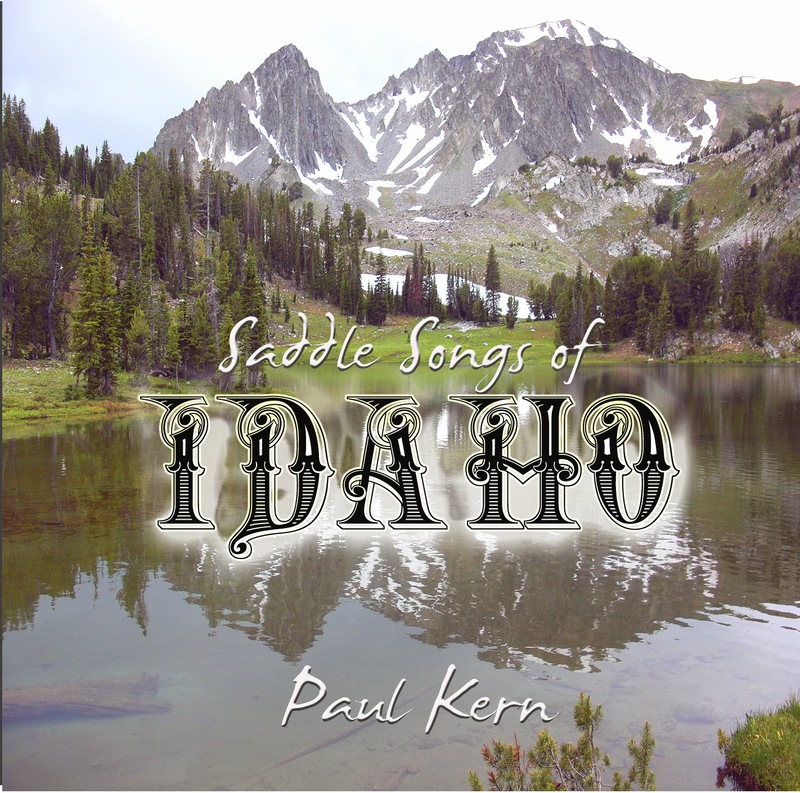 CDs by Paul Kern reviewed in "Rick Huff 's Best Of The West Reviews"
Here’s as honest an interpreter of original works as you’re apt to find! Utah Cowboy Poet Paul Kern has once again managed to project that subtle energy in his low-key approach. I don’t recall another time a poetry CD’s title track was a mere :52 seconds long, but Kern gets the job done with it. He writes with a clear and careful economy of words to evoke his images, and he does it in perfect meter. All the tracks are worth a close listen, but for those who require them some picks include that title track “Morning After Rain,” “If He Nickers At Yer Comin’,” “I’ll Just Have To Pay Myself,” “The Last Horse Trade,” “Nary A Track,” “A Trajectory Off Course” and “So Long, Lee.” Particularly effective is the musical support on the album from Clive Romney (guitar) and Tom Hewitson (also on guitar, harmonica and mandolin). The CD is available for $10.00 by clicking here with his previous fine release Rimrock. 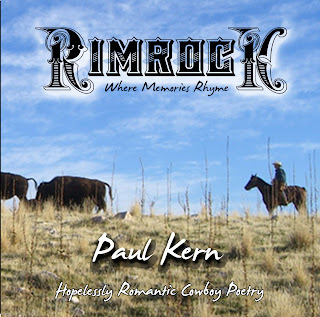 Paul Kern subtitles his CD Rimrock with one of his lines "Where Memories Rhyme," then goes on to further define the collection as "Hopelessly Romantic Cowboy Poetry!" I'd call it more "hopeful and art-filled! "This CD is the recorded companion to Kern's book of the same title. The crafting of these verses shows Kern to be wonderfully in command of what he wants to say, and his low key but involved delivery draws you in so you care about the message. More poets and reciters would do well to take notes on the Jay Sniders, the Joel Nelsons and the Paul Kerns...and, yes, in drawing the comparison I am indeed placing his work on this CD in those ranks (as well as revealing a bias of mine against "theatrical" delivery of Cowboy Poetry)! He understands in recording he's not addressing an auditorium. 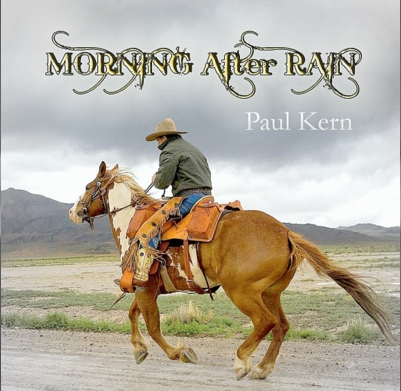 Kern's words frequently present lingering thoughts and lessons that transcend the workaday cowboy life. "From a horse camp with its rhythm of chores, you learn the needs of others come before yours" is a good example. His poem "As I Bridle In The Morning" and others are rich with observations. "On Smokey Before I Go" is one of the best I've encountered depicting an old cowboy's last ride. Particularly effective music pads from Shaun Harris Studios used throughout enhance this product. The CD ($10.00) can be ordered online and paid with a credit card by clicking with your mouse right here. Over there across the river. ‘Til the howling pitch is high. As evening drifts on by. As it echoes through the sage. As evening sets on the Yellowstone. Say who? It’s me Lee, you know – Paul. Hell, I reckon I’ll be 100 next January 8th. Just a few more months now, d’ya think He’ll wait? I’d like to see her, but she don’t know me now. Where’s your Dad? I’ve been waitin’ for his call. He passed away Lee, passed away last fall. Best friend I ever had – You say he’s gone now Paul? So yer Daddy’s gone now, did you just say that? My Dad died in my arms, cancer too so long ago. Hey Lee, remember your buckskin paint? Sure you do, remember when he wouldn’t wait? I have him in the trailer out front – want to see? You bet I do – get that walker here in front of me. Stiffed up in these remanufactured knees. Hold my arm now, don’t let my walker roll. You know Paul, horses are in my blood. Lee, I’ll help you on if you’d like. Not now but another day I might. Damn – it’s good to see you. Thanks for comin’ and come back again. You know - I’ve been blessed to have good friends. Me too Lee. So long - So long Lee. It is haying season in the west. Last winter many people simply ran out of hay and livestock went hungry for a while. Not only was it generally unavailable, if you could find it the prices were doubled. Several neighbors ended up paying $10.00 a bale for mediocre hay. We had enough hay of our own production for our needs, so the shortage did not affect us. The season has changed and we have swung into action on the Quarter Circle K. Our first crop is in and the second is on its way (Photo is of one of our fields). Last winter I wrote poem called “When Emerald Strikes the Clover” which was a wistful anticipation of the coming of Spring. What I never mentioned in that poem was that when the alfalfa (clover) grows, the work begins – starting with the repair of haying equipment. I have recently completely rebuilt my hay mower and wanted to share a tip on sickle bar riveting that someone, someplace may find useful. Once that’s done, I’ll add the poem. Whether you are using a swather or a sickle bar mower to cut hay, both work on the same principle. They each have a long cutting knife that cuts a swath from five to thirteen feet wide. (A swather is a combination implement that not only cuts, but conditions and rakes the cut hay into windrows in a single pass.) 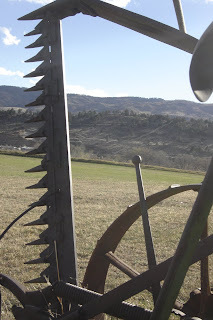 The cutting motion is based on a scissor-like action between the stationary rock guards and the blade comprised of two-inch triangularly shaped knife sections individually riveted onto a bar (two rivets each) which is either activated by the tractor PTO (power take off) or the swather itself, if it is a self propelled model. At any rate – here is the tip. During the mowing operation one of the knife sections is bound to break a rivet and will need to be re-riveted. Breakage may due to hitting a rock in the field or through normal wear. The remaining rivet of the two will need to be removed. To do this, use a clinch cutter that we use in horse shoeing. This tool has a sharp punch on one end and a metal cutting blade on the other end and is made to be struck with a hammer to cut off the clinches of old horseshoes to facilitate their removal. Clinch cutters work just as well to cut sickle bar rivets. Grind the punch end down to the exact diameter of the rivet hole for rivet stem removal. When a section needs to be removed, cut the head of the rivet with the cutting blade end of the clinch cutter by holding it in place and striking firmly with a hammer. The head will pop off. Then take the ground end of the clinch cutter and tap out the remaining stem of the rivet. To replace the section, hold the section and the rivet in place using two hammers – one on the bottom of the rivet acting as a mini-anvil and the other used above to forge-set the rivet head. I am sure that all of this sounds totally Greek to those that have never needed to do this, but for that have, we are talking the same language. I know that there are other ways of doing this, but this works pretty slick and I hope it helps someone out there. If it does, send me an email. I have a bunch of other tricks up my sleeve as well when working with sickle bar mowers. Dark days are blowing over. When emerald strikes the clover. Cold days are nearly over. Till emerald strikes the clover. The shoer is driving over. But am glad when it's all over. And emerald strikes the clover. Blue skies have taken over. Wintertime in January and February can get pretty tiresome in the intermountain west. Though we enjoy the four seasons and have plenty enough to do - horse-drawn sleighing, skiing, snowmobiling and the inevitable indoor home repair projects, it is nice to occasionally cast a glance to the springtime. I wrote this short poem last spring as I had been out to my hayfields early in the morning and came away just striken with the simple beauty of the alfalfa plants glistening in the sunlight that morning after rain - somehow, it just all seemed right and good. The photo is of that same hayfield, but after the first cutting. You'll notice that we do hay the old fashioned way (sans bales) and with pitchfork in hand. I live for days like this. Why'd He Have to Steal My Boots?